For several years, the virtues of multiplayers have been shouted from the rooftops and they are many and varied. The key for many operators is the ability to offer gaming to multiple players with minimal staffing – the no-hassle operation of a slot for the table gaming area, if you like. But multiplayers can serve a very specific purpose in the modern casino, which is to teach players a game, or even to work as a transition for players that are more used to an online gaming scenario. In the casino, are the players migrating to different gaming experiences really so different? The Hippodrome Casino’s John Strydom explains, “It’s a different kind of player. The players on electronics are often new to the game to start off with, they feel intimidated by the action on the live table with the dealer calling for bets, especially during busy periods. Those are the players that migrate on to electronics first so they can make their mistakes privately and learn the game at their own pace. Once they are comfortable with it they may migrate on to the tables but often, electronics players stay with the terminals because they are comfortable with it.” It’s not just the higher potential returns on a terminal that appeals to the casino, either – you can cater to players right across the denom spectrum, says John: “We find that time-on-device players and people that like to play a lower denomination can be catered for easily with terminals too; you can cater for big players that want to play £1000 a spin. A table by itself doesn’t cater for the whole spectrum of players, where a terminal can fill that need cross the floor.” Of course, a Touchbet or Sabre terminal can play from a live feed or an automated wheel, such as the type Alfastreet, Interblock and several other companies provide. Are the players different again here, from a live wheel to an automated setup? And is speed of play the main reason some players prefer the automated play? John elaborates, explaining that the Hippodrome has a semi-automated wheel, “with a spin button available so the player can dictate playing speed themselves. That’s obviously only for a single player, when there is more than one player at the wheel it plays like an auto wheel. “In the morning when it is quieter on the floor, and the spin rate is high enough on the live table, people will play the live table. As soon as it gets busy in the evening and the spin rate drops on the live table, people migrate to the auto wheel because the spin rate is higher. Players are certainly conscious of the speed of play. Initially I thought you would have two spectrums of the market, one that will come and only play live tables and one that seeks out the automated roulette, but experience shows people play both, dictated by the speed of play. “We get busy on the weekends and that can mean up to two-and-a-half minutes between spins on a live table, that’s a long time. The automated wheel gives us 52 spins an hour, every hour.” The Hippodrome recently removed its Punto Banco offering from the floor, as players had intimated they didn’t like the terminal itself, so the casino has fed back to the manufacturer and a new slant-top version is being sourced. Removing the terminals has had a positive benefit for some players, however. “We had quite a few players come in, sit on the dice terminals and get to know the game and bets, then migrate to the live table,” John said. 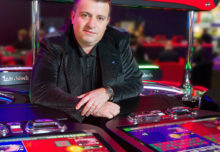 “Once we moved the terminals out, we have noticed people that only played on the terminals have now migrated to live tables because they like the casino and they like the game – but they had nowhere else to play it in this casino.” The Hippodrome uses TransAct’s Epicentral across gaming product, including multiplayers and terminals, which in its early days found a small stumbling block for John – they couldn’t distinguish which game the player was betting on, so could not micro-target to the player using the marketing potential of the printer, but this is changing, says John. “Fortunately the industry is moving towards cloud- and server-based where we would be able to know the difference and be able to target-market specific players according to what games they play. “With Epicentral it’s very useful to be able to target market specific players and bring them back another day. We have an 87% redemption rate on the free play promotions, which is quite a percentage.” Multiplayers and terminals will become an ever more important part of the casino’s marketing arsenal in the future, as the experience at The Hippodrome Casino attests. NOVO LINE Novo Unity II – Electronic multiplayer gaming par excellence! As the originator of and still the leading provider of modern electronic multiplayer games Novomatic is at the forefront of sophisticated product development. Novomatic electronic multiplayer products offer the guest an authentic live gaming experience at reduced costs for the operator. With a constantly growing choice of available games Novomatic provides operators with top quality solutions for maximum electronic live gaming entertainment in great style. In the mid-90s, at a time when the numbers of players at live-tables were deteriorating to an all-time low, AGI pioneered a gaming product that combined the best of both slot and live table play: the first electronic live-gaming multiplayer product, Novo TouchBet Live-Roulette. The concept became an instantly successful phenomenon and created a whole new trend in gaming entertainment. Since then, the Novomatic multiplayer product family has been expanded and the enhanced game range has attracted significant international success in casinos all around the world. The concept of joining a table game via individual player terminals has convinced live-gaming purists as well as newcomers, confident high-rollers as well as timid beginners and even won entirely new audiences for traditional casino table-games. Today’s Novomatic electronic live games are based on the innovative NOVO LINE Novo Unity II platform. The unique feature of the NOVO LINE Novo Unity II system is the flexible interconnection of a great variety of electronic live games and slot games on a virtually unlimited number of individual player stations. This multi-game functionality allows the operator to link any chosen number of terminals to any number of different games such as Roulette, Baccarat, Bingo, Black Jack, Poker and Sic Bo as well as a great slot games offering all within one installation: thus choosing the best from server based slot gaming solutions and electronic live games. NOVO LINE Novo Unity II offers numerous advantages through its innovative server architecture and the integration into the comprehensive NOVO LINE system: • Unique multi-game capabilities – electronic live games and slots available in one system! • Sophisticated 3-D animated game layouts • Flexible, casino floor management • Unlimited number of terminal connections • Unlimited number of game types • Online real-time monitoring • User-friendly configuration and maintenance • Future proof infrastructure • Implementation of third party utility devices such as TCS’ Infinity Auto Dealer or Double Action Roulette The choice of Novomatic electronic multiplayer games comprises: the fully automated game versions (such as the Novo Multi-Roulette), the semi-automated, dealer-operated versions (such as the Novo TouchBet Live-Roulette) as well as the virtual game versions (such as the Novo Flying Roulette). The respective game versions are available for a great range of electronic live games such as Roulette, Baccarat, Bingo, Poker, Black Jack as well as Sic Bo. The latest additions to this great range of electronic live games are the Novo Multi-Black Jack and Novo Multi-Baccarat, both of them employing TCSJohnHuxley’s innovative Infinity Auto Dealer – a revolutionary utility device that offers continuous, fully automated, real-time, card shuffling and dealing using standard casino playing cards. Another innovation in the world of electronic live games is an amazing unique variation of the traditional game of Roulette with odds up to 1,200 : 1! Novo TouchBet Live-Roulette Double Action and Novo Flying Roulette Double Action deliver two winning numbers from one single spin of the wheel. TCSJohnHuxley’s special Double Action Roulette Wheel features two counter-rotating number rings, each with a traditional set of numbers situated in opposing order. Each spin of the wheel generates two winning numbers: one on the inner ring and one on the outer ring. Popular cabinets such as the Novo-Bar (available in slant top or bar top configuration) or the NOVOSTAR SL1 slant top cabinet have a perfect ergonomic fit and display the game ideally for maximum player experience. Through its innovative server architecture NOVO LINE Novo Unity II holds a vast potential for further developments of an extended product range and new functionalities. Triple Crown was established in 2009 as a joint venture of Mozzart and Fazi companies. Its aim was to offer new technical and creative solutions for production of electronic roulettes to the international market. In a short period of time, Triple Crown brought together a team of experienced IT experts and engineers, who together with Karim Rashid, the world’s famous industrial designer, offered to the gaming market a new portfolio of electronic roulettes with different combinations of games and possibilities for multiple winnings. The significant difference between the Triple Crown and other electronic roulettes lies in the three active wheels that offer player three winning numbers, the additional gaming options, multiplied winnings, and consequently – the adrenaline rush and excitement. The unique combination of card games and roulette in Triple Crown Game and Triple Crown Poker is the real challenge for players. The elements of Triple Crown roulette are: the central unit with three active wheels and space for eight play station modules, as well as independent modules that can be connected to the base in unlimited number but do not have to be in a close distance. In 2013 the Fazi Company extended the product range with the new Key One roulette family, offering different design solutions of electronic roulettes with the same high quality of product and diverse functionality. Key One stands for impressive and modern design, highest possible quality of components, cutting edge manufacturing technology and reliable game software. Our products’ quality is superb, while our prices are more than competitive! We have exhibited for five years in a row at ICE Exhibition in London and we’ve sold more than 800 roulettes to happy customers all over the world. We are proud to tell that our products are certified with the worldwide GLI 11 – Gaming Devices in Casino standard Certificate, as well as the specific national certificates according to the law in several countries, such as Holland, Spain, Macau, Belarus, etc. Also, after signing the distribution contract with Spanish Grupo Orenes for the territory of Spain, Portugal and Mexico, and almost closing the deal for the South-East Asian markets, we want to penetrate other countries’ markets. Our medium-term strategy has already been giving us lots of benefits and possibilities to expand steadily and quickly all over the world. We’ve sold great number of products to satisfied clients from almost all continents, and now, after we’ve joined forces with globally very serious partners, we’ve already initiated important steps to mark huge presence in all continents. Taking into account the quality of our products, the capacity to make any project or idea come true, as well as the professionalism and business ethics of our stuff and management – in no time will you see Triple Crown and Fazi Companies – all around the world! Our vision of the future includes maintaining the actual superb quality, development of innovative products and the conquest of new markets. AMATIC Industries lives and breathes electronic multiplayer. This bold statement is simple to clarify: The Austrian gaming company has over twenty years of experience in developing and manufacturing electronic gaming machines – in other words MULTI GAME – and made the strategic decision at the turn of the century to enter the multiplayer market, naturally all of which is “designed & made in Austria”. Electronic roulette comes in several forms – ideal for differing operator and player requirements. The Grand Jeu multiplayer roulette has grown over these years to become a firm favourite. The AMATIC thirst for innovation is reflected in the Grand Jeu electronic roulette multiplayer range. The latest electronic roulette – the Grand Jeu Double – incorporates two roulette wheels. The focus is on player choice. The player can choose on which wheel he or she wishes to place the bet. Should legislation allow, then bets can be placed on both wheels at the same time. This all-in-one multiplayer includes four large display monitors as standard that are positioned centrally above the wheels. All key roulette statistical data can thus be clearly shown. The Grand Jeu Double is definitely a show-piece and is best placed where it is centre of attention. The Grand Jeu 22WS is an eight-player electronic roulette multiplayer in a round design. It has improved graphics, wider monitors and unique player features. The Roulette Grand Jeu Prestige is yet another example of Austrian flair in a traditional design aimed at the more conservative player. All AMATIC Grand Jeu multiplayers can be connected to further separate live or electronic roulette tables. This technology supports a total of four roulette wheels at a time – offering optimal player choice. Furthermore, AMATIC Industries is a pioneer in offering a big variety of Casino slot games on the Roulette. The Grand Jeu & Games with AMATIC`s popular Multi Game configuration will be a forthcoming multiplayer focus product. Unique innovation is the key for AMATIC. This can be seen in the – the Turbo Card Roulette. This joint invention is patented to INAG in the USA and has passed all necessary GLI testing. It offers card-based roulette. Operators have distinct advantages when offering Turbo Card Roulette in comparison to conventional roulette. It requires minimal training for operators and surveillance – it is designed to allow no operator errors and no casino bleed. There is no decrease in decisions per hour as more players join the game. Furthermore, it is fully expandable as AMATIC Industries has transformed this into an electronic version providing the necessary software and hardware (including touchscreen monitors). “We see ourselves as a pioneer in global gaming at AMATIC Industries. We have great knowledge of player needs both on the slots and table gaming sides. It was and remains our goal to define these markets. Electronic roulette is a great strength of ours. Therefore, we are proud of the contribution we have made for this segment to grow so strongly”, explains Mr. Thomas Engstberger, sales manager at AMATIC Industries. Naturally the Grand Jeu multiplayer solutions will be displayed on the AMATIC stand S3-150 at the forthcoming ICE 2015 in London. ALFASTREET SINGLE TERMINAL SL At Alfastreet we take great pride in all of our products, as we feel that each of them reflects our pursuit for the best innovative solutions, superior craftsmanship and total adaptability to our client’s needs. Our signature single terminal design has been around for a while now and has become the reference product all over the business. It’s level of adaptability, flawless ergonomics and undisputed quality has made it a benchmark for excellence in gaming. Over the years we’ve been constantly improving all aspects, in order to provide maximum comfort and usability for the players as well as reliability for the clients. The latest incarnation is the Alfastreet single terminal SL with a huge 23” screen and beautiful presence, which made it one of the most popular terminals on casino floors of the world. The machine can be arranged in different settings and connected to almost infinite number of electronic or live cylinders, depending on casino layout and client’s wishes. It incorporates the special option “Multigame” and “Simultaneous play”, which enables a player to choose from a great variety of Alfastreet developed entertaining games (Roulette, Sic Bo, Craps, Baccarat, Dragon vs Tiger, Big Six, various versions of Poker, Derby… new ones are coming!). Unique simultaneous betting option enables double play at the same time (courtesy of the big 23” touch screen), therefore maximizing the enjoyment of the player. The patented solution for combining the live table outcomes, enables the players to choose simultaneous betting option also in combination with live roulette wheel, which can be viewed through optional monitors on the terminal or video walls. Our efforts to strive for the highest level, complete customization and adaptation to our client’s needs are seen in all of our products. Both “Multigame” and “Simultaneous play” features are also available on our other products, the signature 8-station roulette R8 and the versatile table tops. The table tops are a very convenient and practical possibility to extend the gaming option and enjoyment to the other casino spaces – it’s light and versatile design enables our clients to put it on casino bars, or in more restricted spaces, not renouncing to any of the options our other terminals provide. At Alfastreet the anticipation for the upcoming ICE London in February is rising, as we cannot wait to reveal to the world the latest versions of our products and some big surprises! The APEX PLAYER STATION is the APEX gaming solution for the electronic multiplayer market. Taking gaming to the ‘next level’ is the philosophy around everything APEX does. Thus, the APEX PLAYER STATION offers that much more in innovation and entertainment to the multiplayer segment. The first step into this market was a bold one – with the introduction of a completely new game, previously unheard of and naturally patented by APEX. QUIKKER is a card-based multiplayer that unites the best of BLACK JACK with ROULETTE. Players bet on the outcome of two cards – such as pairs, same colours, the sum of the cards. This means that players bet on the outcome on two cards just like BLACK JACK. Then it moves more towards roulette as there are a whole range of outcomes to bet on. You can bet on the colours, the numbers, the range of numbers, whether they will be a pair and much more. The potential win relates to the mathematical probability. Whereas roulette only allows a multiplier of up to 36 times the stake – QUIKKER goes up to a multiplier of 300 of the stake. QUIKKER has been joined with three further games to create the APEX PLAYER STATION (APS). Now operators can offer their customers four completely different table games – namely ROULETTE, SIC BO, BACCARAT and QUIKKER. The APEX terminals and exquisitely designed and manufactured. Customers can choose themselves how many terminals to place around the electronic roulette wheel, also available from APEX. Thus, the APS is completely flexible and modular and can be expanded according to customer requirements / demand. Just think of ‘4 x 4’ and this applies to the APS. The first ‘4’ refers to the four different table games available – ROULETTE, SIC BO, BACCARAT and QUIKKER. The second ‘4’ refers to the possibility to link the APS to four separate roulette wheels – both electronic and live. SIC BO is even available in three different versions – ‘Macao’, ‘Atlantic City’ and ‘Australia’, so taking fully into account the regional differences in this game. Now think of ‘4 x 4 Plus’. The ‘plus’ refers to yet a further benefit that APEX offers its customers: the terminals can be linked to the APEX slot games. As an operator, you have more choice than ever before. Players can play on four separate roulette wheels, they can choose between four separate table games and furthermore choose from the great selection of APEX slot games with industry-famous games such as LEONARDO’S CODE and OCEAN TALE. This makes an investment in the APEX PLAYER STATION a unique opportunity to provide so much gaming entertainment from just one player station. The APS is GLI certified and incorporates the industry’s best components for money handling, ticket printing and touchscreen technology amongst others. APEX also has an excellent reputation for 24/7 gaming uptime which is essential for both players and operators. No player wants a popular machine out of order and no operator wants to lose the chance of income with a machine switched off. The win-win is therefore very strong here when choosing APEX. Mr. Max Pessnegger, CEO of APEX gaming, sums up the added value that the APS is bringing to the gaming world, “The goal has been to create a player station that offers more. More games, connected to more roulette wheels with more slot games available. The APEX Player Station offers fantastic value for money with so many possibilities to offer players great gaming entertainment. We are proud to state that the Apex Player Station is bringing multiplayers to the next level”.